Wichitans might be surprised to learn the cost of cultural attractions. The price of adult admission to the Wichita Art Museum is $7.00, or free on Saturdays thanks to the generosity of Colby Sandlian, a Wichita businessman. But the cost of admission is much higher. For 2015, Wichita city documents report a cost per visitor of $55.37. This was eight percent over the target cost of $51.24. 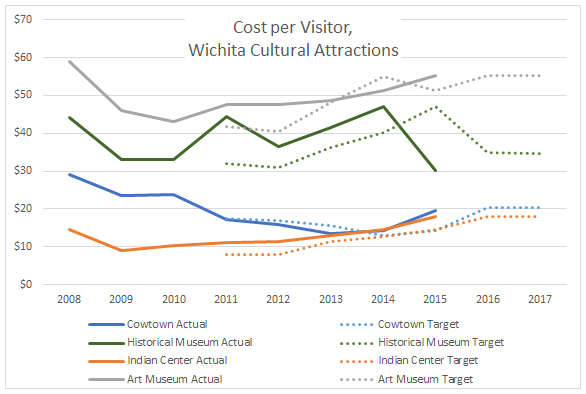 Cost per visitor to Wichita cultural attractions. Click for larger. The cost per visitor figures the city reports each year are presented in a nearby table. For each year the city reports the cost per visitor along with a target for the next years. In the nearby chart, the target values are represented by dotted lines of the same color as the actual cost. The source of this data is Wichita city budgets and performance reports. All are available on the city’s website at wichita.gov. What are the benefits per visitor that decides to spend the weekend in Wichita and visit some of it’s attractions? What’s the benefit of a convention being held in Wichita? What’s the benefits per visitor when a corporation decides to move to Wichita or stay in Wichita partly because of the cultural attractions that the city offers? It seems your calculation takes none of the real benefits of gov’t sponsored attractions into account.